SUMMARY: The 2018 Beast X -8 drop youth baseball bat features all the same innovative Easton technological enhancements found in the Beast X -10 drop but with one major variance. The Beast X -8 drop encompasses Easton’s end loaded swing weight which sacrifices some balance for added power. The 2 5/8 barrel houses Easton’s X-tended barrel design and Z-CORE internal core technology giving youth hitters an enlarged sweet spot and the longest barrel in youth baseball. The entire youth bat is composed of a single piece aluminum construction featuring Easton’s Advanced Thermal Alloy Construction (ATAC) which applies an unmatched sound and explosive energy upon the baseball. The ATAC handle comes with Easton’s 1.4mm HYPERSKIN grip distributing supreme comfort and a natural feel when stepping to the plate. The 2018 Easton Beast X -8 drop is perfect for youth ball players who demonstrate above average hitting abilities being able to handle an end loaded unbalanced swing weight that carries more aluminum material within the sweet spot region. If your ball player is seeking an alloy youth bat geared more towards enhancing power and strength over balance and speed, the Beast X -8 drop is perfect. OUR REVIEW: Like many youth baseball bats featuring a height/weight of -8 or less, it’s very important for young players to master a balanced and quick swing before establishing a power swing. For these reasons, our staff reserved the Beast X -8 for kids who were able to maintain a level swing with the slightly more dense youth bat. After approximately 250 swings of solid contact, below is our official review of the 2018 Easton Beast X -8 Drop. POP: With the new 2018 USA Bat standard, the most significant change will undoubtedly be the loss of pop vs. older youth baseball bat models. When evaluating the 2018 Easton Beast X -8 drop, our volunteer youth hitters who swung it displayed slightly longer distance upon contact when compared to how those same hitters performed with the Beast X -10. With an end-loaded swing weight and some extra mass, the Beast X -8 provided about 10 extra feet on average per solid contact swing vs the Beast X -10. To our staff’s surprise, none of our youth hitters seemed to have much difficulty with the end-loaded swing weight either. VIBRATION CONTROL: When measuring the vibration control, this category comes directly from the feedback gathered on our volunteer hitter’s scorecards. As expected, some of the 250+ solid swings brought about some negative stinging sensations especially with the Easton Beast X being a single piece alloy construction. However, the overwhelming majority of our volunteers noted feeling little to no vibrations. Overall, this USA youth bat does a great job of reflecting vibrations. DURABILITY: The 2018 Easton Beast X -8 took on a lot of solid reps during the course of our review. After taking over 250 solid contact swings, this youth USA baseball bat displayed some handling marks and scratches but nothing that would impair performance or eligibility in games such as dents or cracks. Like most Easton models, the 2018 Easton Beast X -8 held up well. 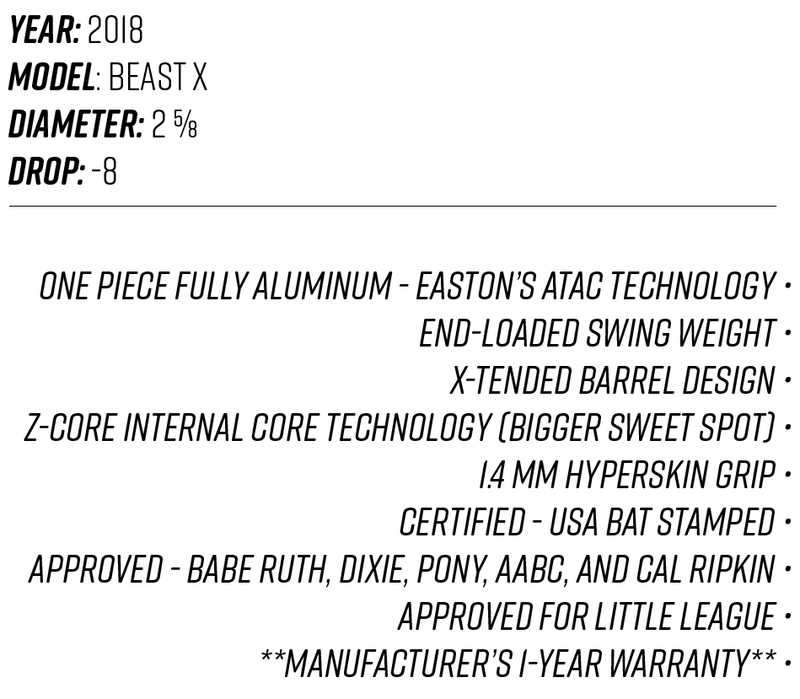 OVERALL EXPERIENCE: If you are a parent looking for a slightly heavier aluminum youth baseball bat that can add a bit of extra pop in your child’s swing, the Easton Beast X -8 can provide an answer to your searches. Please note: With the Beast X -8, make sure your child possesses the size, skills, and abilities to reach a level swing with an unbalanced weight distribution.